Andrea Arden, star of Animal Planet’s Underdog to Wonderdog, recently completed a shoot for the television show, Designing Spaces,which airs on Lifetime Television. During the segment Arden will show viewers the Simple Solution OXY Charged Stain and Odor Remover that is designed to rid the home of stains and odors. Simple Solution is made by The Bramton Company and this shoot was a part of BrandStar Entertainment. 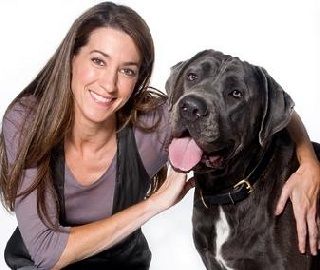 Arden is the Director of Andrea Arden Dog Training in New York and has authored many books, including Dog Friendly Dog Training and The Little Book of Dog Tricks. Having served on the Board of Directors for the Association of Pet Dog Trainers (APDT) and is a Board of Director at the present time for Animal Haven Shelter and Sanctuary. Designing Spaces is a half-hour television show on Lifetime Television that has been on the air since 2005. Filmed in Miami, Florida, the show is hosted by Debi Marie and David Jones. BrandStar Entertainment produces The Balancing Act show that airs on Lifetime Television as well. The show is geared at inspiring and empowering women with entertaining and educational segments. The vision of BrandStar is to engage, entertain, and educate. The episode of Designing Spaces featuring Andrea Arden will air on Lifetime starting in April. For more about Designing Spaces on Lifetime, visit www.designingspaces.tv. The official website of Simple Solutions is http://www.simplesolution.com/index.html. Learn more about Andrea Arden by visiting www.andreaarden.com.